Coffee and human souls! Its just what a busy business-person needs! yes, corporations have created relentless stress induced zombies hopped up on coffee consuming human souls everywhere. Coffee and human souls, I like it! I can’t shake the feeling that Pauline reminds me of Michael Jackson here. Did she eat his soul? You wouldn’t want to get “the stress” now would you. Hey, I didn’t know Pauline worked at the same company I do! If panels 3 and 6 were t-shirts, I would buy them. There you go maam here’s your coffee, light on the cream heavy on the souls just like you asked. 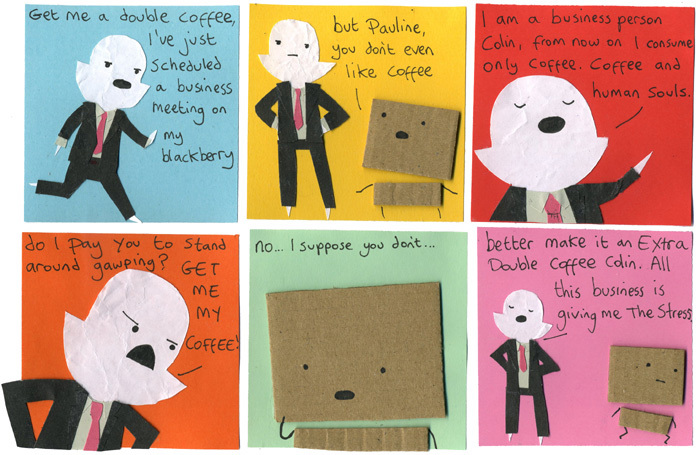 i love that she doesnt actually know any real coffee names xD just coffee with double-extra power! I hate when I have The Stress. Her outfit reminds me of Ellen Degeneres…but her personality reminds me of Satan!!! haha awesome, can’t help imagining her Blackberry as a literal blackberry. hah human souls oh paper Pauline you are a card, or should I say paper? Delicious human souls. I’ve read a bunch of these and I think this is my favorite one. Now whenever I look at my business friends I imagine that is all we do, eat souls and drink coffee. Pretty accurate. The third panel is soo like Pauline.